George W Bush has made a robust defence of his administration's record in his third State of the Union address since becoming US president. He insisted that his foreign policies, including the invasion of Iraq, had made Americans - and the world - safer. He also emphasised his domestic agenda, with an upbeat assessment of the strength of the US economy. The speech is being seen as Mr Bush setting out his case for re-election in November, before a challenger emerges. "America this evening is a nation called to great responsibilities. And we are rising to meet them," Mr Bush told a joint session of Congress. "We have not come all this way - through tragedy and trial and war - only to falter and leave our work unfinished." The BBC's Justin Webb in Washington says that although Mr Bush did not say it in so many words, the sense of this speech was obvious - it would be dangerously wrong to change the leader during a time of war. The speech, which was watched on television by millions of Americans, came a day after the contest to find a Democratic presidential challenger was thrown open by the surprise win of Senator John Kerry at Monday's Iowa caucus gatherings. 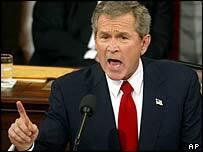 Mr Bush said the war on terrorism he launched following the attacks on New York and Washington was far from over. "Twenty-eight months have passed since September 11, 2001 - over two years without an attack on American soil - and it is tempting to believe that the danger is behind us," Mr Bush said. "That hope is understandable, comforting - and false." The president urged Congress to renew controversial anti-terrorism laws that critics say damage civil liberties. "We must continue to give homeland security and law enforcement personnel every tool they need to defend us," he insisted. Mr Bush said the use of force in Afghanistan and Iraq had paid dividends elsewhere, persuading Libya to abandon its programme to develop weapons of mass destruction. Constitution requires that president "shall from time to time give to the Congress information of the State of the Union, and recommend to their consideration such measures as he shall judge necessary"
Taking a sideswipe at opponents of the Iraq invasion, Mr Bush said: "America will never seek a permission slip to defend the security of our country." He added: "Let us be candid about the consequences of leaving (former Iraqi leader) Saddam Hussein in power. Had we failed to act, the dictator's weapons of mass destruction programmes would continue to this day." The president of Iraq's interim Governing Council, Adnan Pachachi, was among those watching the speech from the visitors' gallery. Mr Bush pledged that despite continuing attacks on US-led occupying forces in Iraq, they would remain in the country to oversee a transition to democracy. He also spoke of his desire to spread democracy throughout the Middle East. Much of Mr Bush's speech focused on his domestic policies - trying to improve school standards, extending access to prescription drugs for senior citizens, and immigration reform. He insisted that the US economy was growing stronger, partly as a result of his tax cuts. "The American people are using their money far better than government would have, and you were right to return it," he told his audience. With opinion polls showing the economy as a weak point for Mr Bush, correspondents say the president is anxious not to repeat the fate of his father, who won a war in Iraq but failed to win re-election after the economy faltered. Mr Bush also appealed to his conservative support base by urging sexual abstinence as a way of cutting sexually transmitted diseases among young people. He signalled his support for a constitutional amendment outlawing gay marriage, vowing to "defend the sanctity of marriage". The president also proposed an additional $23m for schools that wanted to use drug testing "as a tool to save children's lives". "September 11th has defined this presidency"